Vodafone 10GB Data in Price of 1GB for 4G Mobile users .Are you a Vodafone users and have you purchased any 4G Handset after 27th September or planning to buy one till 31st Dec? If your answer is yes then here is one good new waiting for you. Vodafone India offering Free 9gb data in price of 1gb data just for you. - Vodafone Subscriber who has purchased NEW 4G HANDSET during the Offer Period 27th Sep to 31st Dec and inserted the Vodafone India SIM and is active on: – (i) a 4G data pack or on a 3G data pack>= 1GB in 4G/3G Circles. - Free 9GB of 2G/3G/4G data if the subscriber recharges with a 1GB or above Pack (for Prepaid) or is on a Postpaid plan of 1GB and above. - Any customer who has bought a new 4G Handset with a Vodafone SIM need to visit Vodafone web portal (www.vodafone.in/smartoffers) wherein they have to opt in the free 9GB offer from a link available and when the subscriber gives consent for the free 9GB Offer, he needs to recharge with 1GB or above pack in case of prepaid and in case of postpaid, subscriber has to have 1GB or above rental plans already availed . 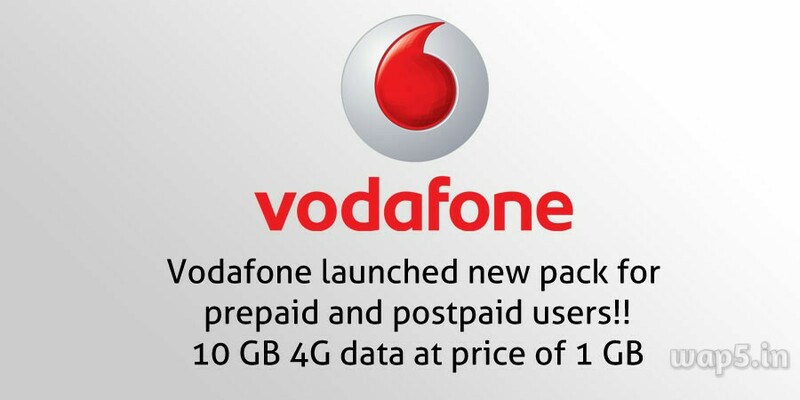 How to Gey Vodafone 10GB Data in Price of 1GB for 4G Mobile users?